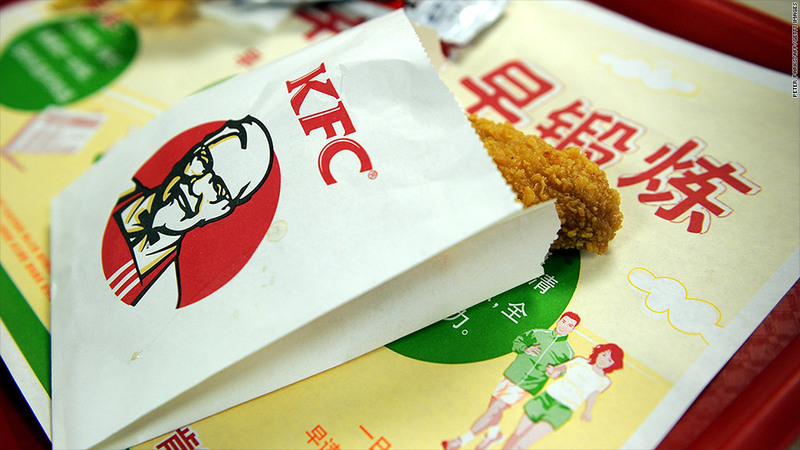 Yum Brands -- which owns KFC -- has faced a number of food scandals in China. A new food scandal has erupted in China, threatening to tarnish the reputations of McDonald's, Starbucks and Yum Brands. An American-owned meat factory operating in China has been accused of selling out-of-date and tainted meat to clients including McDonald's (MCD), Starbucks (SBUX) and Yum Brands (YUM), which owns the KFC and Pizza Hut chains. Local broadcaster Dragon TV aired footage Monday that showed workers using their bare hands at the food plant to process expired meat, and even food that had fallen on the floor. After the report, McDonald's and Yum Brands said they stopped orders from the factory, Shanghai Husi Food, a subsidiary of Illinois-based OSI Group. Yum said in a statement that this may cause temporary shortage of KFC's cheese pork hamburger and BBQ hamburger, and Pizza Hut's stone pan Texas flavor beef. Starbucks pulled its chicken apple sauce panini available at some Chinese outlets, because its supplier purchased meat from Husi, according to a statement. McDonald's hasn't identified specific affected products. Shares in Yum Brands slumped 4.25% Monday. McDonald's, which has over 2,000 stores in China, saw its stock drop 1.5%. OSI Group said it was "appalled" by the television report and has begun an investigation. "We have zero tolerance for any actions that compromise food safety," it said in a statement. "Our company management believes this to be an isolated event, but takes full responsibility for the situation." Local food regulators in China have shut down the factory and launched an investigation. This is the latest in a series of food safety and contamination problems that have plagued domestic and foreign companies in China. Yum Brands lost business in China after a food safety scandal that began in late 2012, and over fears of a new strain of bird flu. Earlier this year Wal-Mart (WMT) recalled some donkey meat after it was found to be contaminated with fox meat. And a series of scares have hit both domestic and foreign makers of infant formula.